7062S- Steel, YFM-250, YFM-350, YFZ-450, YFM-700R. 520 Chain. 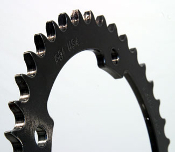 Our Products >> Steel Rear Sprockets, USA >> 7062S- Steel, YFM-250, YFM-350, YFZ-450, YFM-700R. 520 Chain. 7062S- Steel,YFM-250 Raptor 08-2013, YFM-350 Raptor 04-13, YFZ-450,R,X 04-19, YFM-700R Raptor 06-18. 520 Chain. Available in 37 through 43 teeth. Sold in Silver Zinc finish.